Hairless plant growing to 30cm tall with creeping stems, rooting at nodes. 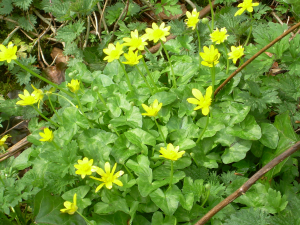 Leaves heart-shaped and fleshy, with wavy margins and long stalks. May have bulbils in axils of stem leaves. Flowers yellow (fading to white) 2-3 cms across, with 3-7 sepals and 8-12 long petals.